Editor’s note: On Dec. 5, the HDRC granted this project a certificate of appropriateness, meaning the single-story buildings mentioned can be razed, and construction can begin thereafter. 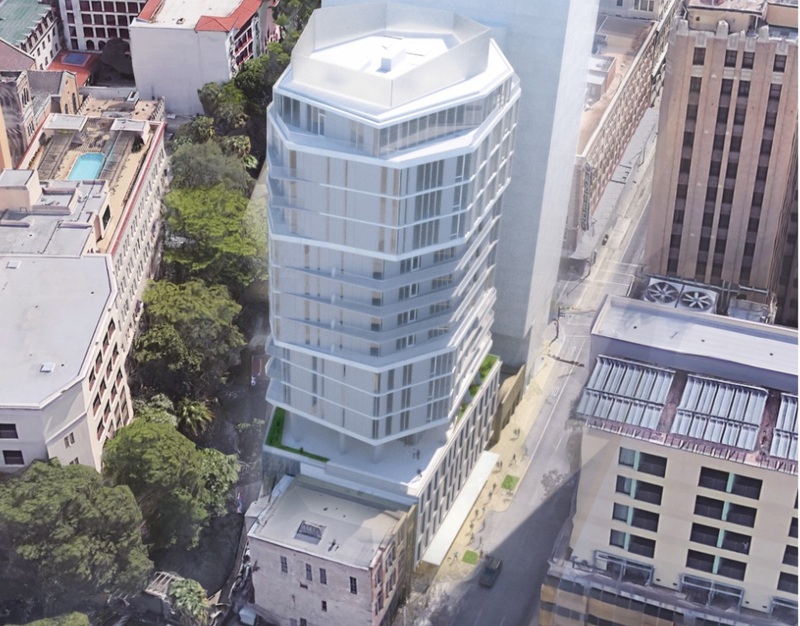 Developer Keller Henderson’s Floodgate residential tower has landed on the Historic and Design Review Commission’s (HDRC) agenda for Wednesday—and its a doozy. If approved, the $40 million, octagonal apartment tower will rise 17 levels from the River Walk, standing between the Chris Hill-owned Esquire Tavern and the Witte building on East Commerce Street. 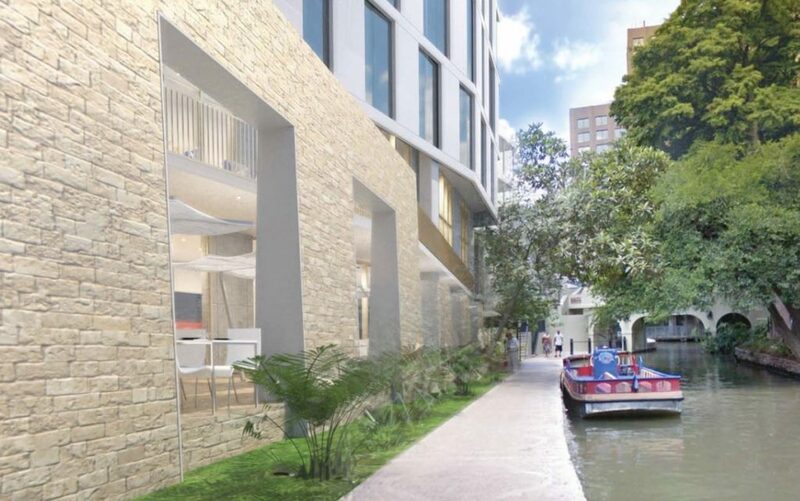 In its contemporary design by Rhode: Partners of Austin, the Floodgate is scooted back from the neighboring Esquire, creating an opening for a new, mid-block River Walk entrance. 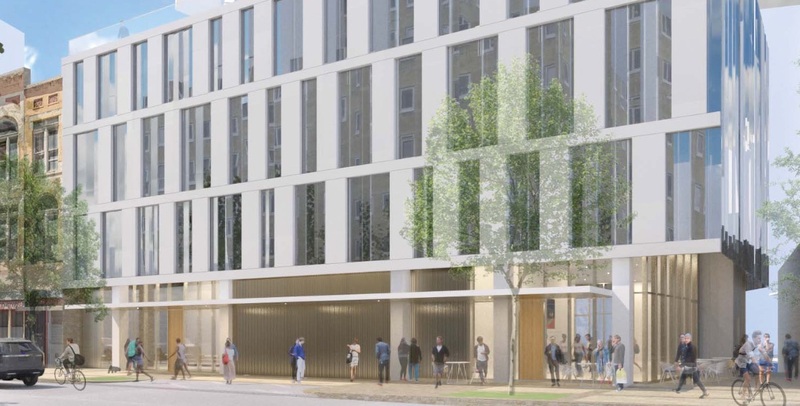 In addition to design approval, Henderson is also seeking permission to demolish the row of vacant, single-story retail buildings that currently sit between the Esquire and Witte. According to the HDRC application, the structures at 139 and 141 E. Commerce St. are designated historic landmarks. Those tenants, including popular restaurant Bella on the River, have already left in anticipation of the Floodgate construction. 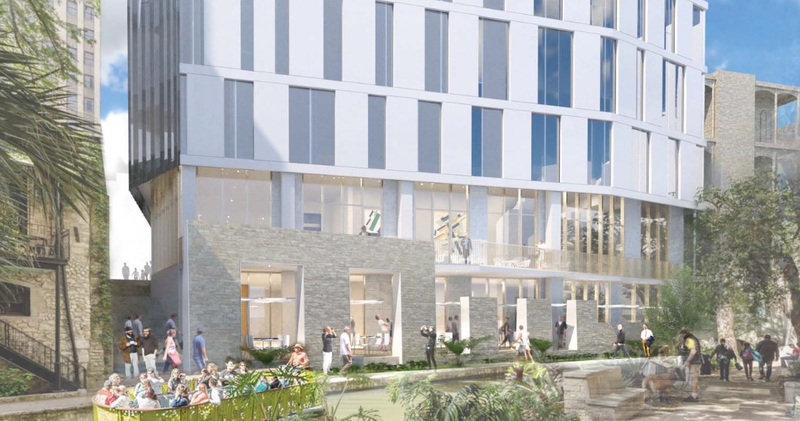 The Floodgate will include 53 luxury apartments, and 15,000 square feet of restaurant space at the river and street levels. Pieces of the historic stone flood wall will be incorporated into the design of the Floodgate at river level, but it’s unclear if Henderson will completely tear down the wall and rebuild it in pieces, or whether it will be semi demolished. The design also shows an automated parking system that will lift tenant’s vehicles to floors 2-4. The fifth floor is an open-air amenities deck complete with a pool and dog lawn. Floors 6-15 are the apartments, which range from 747 to 1,603 square feet. The 16th floor will consist of three penthouses ranging from 1,664 to 1,924 square feet. Henderson has not responded to interview requests from the Heron, but in 2017, he told the San Antonio Express-News that rents would be priced around $4 a square foot. That would make them the most expensive apartments in San Antonio. Doing the math, that comes out to $2,988 a month for the smallest apartment (747 square feet) and $7,696 for the largest penthouse (1,924 square feet). The project is receiving $3.9 million from the Center City Housing Incentive Policy—an estimated $3.1 million in city property tax rebates, $300,000 SAWS fee waivers, $111,288 in city fee waivers, and a $375,000 mixed-use loan. The HDRC application does not say when construction would begin. In June, the Floodgate received conceptual approval from the HDRC, but requires final approval before the one-story buildings can be demolished and construction can begin. Like the glass-covered Frost tower and the Canopy Hilton hotel (on the same block as the Floodgate), both currently under construction, the Floodgate would introduce another contemporary design to downtown’s skyline.